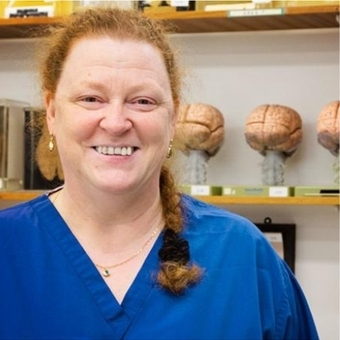 It was a shock to all at the TORT Centre when we heard the news that Professor Dame Sue Black, OBE, is to leave the University of Dundee in June to take up the position of Pro Vice Chancellor for Engagement at the University of Lancaster. Without doubt it is the University of Dundee’s greatest loss and Lancaster’s biggest capture! Professor Black has been a great supporter of the Institute of Motion Analysis & Research (IMAR) and the Master of Orthopaedic Surgery (MCh Orth) that has now been running for 25 years at the Department of Orthopaedic & Trauma Surgery, TORT Centre. We will always be indebted to Professor Black and all the staff at the Centre for Anatomy and Human Identification (CAHID) for their continual efforts in using Thiel embalmed cadavers in hands-on workshops each year. These allow our students the opportunity to experience this unique approach to life-like surgical training techniques. Professor Dame Sue Black with Mr Kamal Deep and MCh (Orth) students at cadaveric workshop. Professor Black officially left today from her position as Director of the Centre for Anatomy & Human Identification (CAHID) where over the past fifteen years she has built forensic sciences and anatomy at the University into a world-renowned centre of excellence and was awarded the Queen’s Award for Excellence in 2013 so it is no wonder why Professor Black has become a household name. Professor Black was the key player to secure the £10m grant from the Leverhulme Trust that led to the resulting research centre that was opened in 2016 by HM the Queen and HRH Duke of Edinburgh. Professor Black was the recipient of over £20m during her time at the University of Dundee. She is a Fellow of the Royal Society of Edinburgh, a Fellow of the Royal Society of Biology, a Fellow of the Royal Anthropological Institute, a Fellow of the Royal College of Physicians (Edinburgh) and an Honorary Fellow of both the Faculty of Forensic and Legal Medicine of the Royal College of Physicians and the Royal College of Physicians and Surgeons of Glasgow. She is the lifetime Professor of Anatomy for the Royal Academy of Scotland. She was awarded an OBE in 2001 and a DBE in 2016. The Saltire Society have named her an outstanding woman of Scotland in 2017 and in 2015 she was awarded their Fletcher of Saltoun award for contributions to culture and science in Scotland. She is a recipient of the Lucy Mair medal for humanitarian assistance in anthropology, the Jephcott gold medal for contribution to science in medicine, the Stephen Fry award for public engagement with science and the Brian Cox award for public engagement. She holds two police commendations for the quality of her work in assisting with criminal investigations. She is most proud that there is a science laboratory named after her in St. Margret’s school in Aberdeen. Professor Dame Sue Black was recently the recipient of the degree of Doctor of Medicine, honoris causa, from the University of St Andrews.